The items listed below are KentuckyRoads.com news items from July 2002. For the most recent updates see the KentuckyRoads.com home page. The Kentucky Transportation Cabinet's us460online.com website now includes a video describing the right of way process . A text transcript can also be downloaded. On July 23, 2002, my internet hosting provider suffered a series of hard drive crashes. All of my websites, including KentuckyRoads.com, and any backups were lost. I believe I have now managed to restore all of the news items and site features from my local backups of the site. A multi part project to widen US 60 between Henderson and Corydon is included in the Kentucky Transportation Cabinet Six-Year Plan. A new bypass north of Corydon will also be constructed. Construction is planned to start near Henderson in 2004. Another Henderson area project is the repaving of the US 41 Henderson by-pass. (The by-pass is at the northern end of the Pennyrile Parkway.) Work there is planned to take place in 2004. The US 41 twin bridges over the Ohio River are planned to be repainted in 2005 and 2006. The Kentucky Transportation Cabinet has released information about planning for I-69 between Eddyville and Henderson in western Kentucky. The cabinet is studying improvements that would be needed to bring the Edward T. Breathitt Pennyrile Parkway and the Wendell H. Ford Western Kentucky Parkway to interstate standards. A new policy at the Kentucky Transportation Cabinet means that an evaluation of the needs of pedestrians and bicyclists will be included in future highway planning projects. The Cincinnati Enquirer reports in this July 23, 2002 article that a project to widen US 27 in Pendleton County will involve the moving of unidentified remains in an abandoned cemetery. The Kentucky Transportation Cabinet will hold a public information session from 6:00 pm to 8:00 pm on August 15 at Hite Elementary School in eastern Jefferson County to discuss the reconstruction of two interchanges on the Gene Snyder Freeway: one at I-64 and one at Shelbyville Road. Five plans for the interchanges were announced last year. At the meeting, one plan for each interchange will be announced. If there are no serious objections, those plans will become the final plans. Construction could start in 2004 and be complete by 2008. The Ashland Daily Independent reports in this Nov. 4, 2001 article (no longer online) that an advanced carbon based polymer coating will be used to reinforce a flawed bridge over the Little Sandy River. The bridge which had been expected to remain stable for three to four years will now be stable for 20 to 30 years. Update Dec. 7, 2001: Here is a Cincinnati Enquirer article about the bridge. Here is some information from the Kentucky Transportation Cabinet describing the historic and environmental concerns they took into consideration while designing a new route for US 68/KY 80 through the Land Between the Lakes . The William H. Natcher Bridge over the Ohio River near Owensboro will be dedicated on August 16; however, the bridge will not open to traffic that day. The approach on the Indiana side has yet to be completed. The dedication ceremony beings at 1:30 pm on August 16 and is open to the public. Visitors will be able to walk across the bridge. Visitors will be able to park on the highway on the Kentucky side of the bridge. According to the Bowling Green Daily News, plans to widen three highways in Mammoth Cave National Park must be approved by 30 regulators. The planning process takes four to five years. The projects will reconstruct park routes 10 and 15 and widen park route 110 to the Maple Springs Research Center. A project to reconstruct the interchange of Hurstbourne Parkway and I-64 in eastern Jefferson County is planned to begin in 2006. The interchange is currently one of the most congested and accident prone interchanges in Jefferson County. The reconstructed interchange will eliminate left turns across Hurstbourne Parkway and add ramps to Linn Station Road. The project has been dubbed "The Big Fix." A planned project to widen US 68/KY 80 to four lanes through the Land Between Lakes National Recreation Area is expected to cause a great deal of controversy. The $250 million project will replace the two 70-year old bridges of Lake Barkley and Kentucky Lake and construct a four lane highway on a 1000-foot right of way through LBL. The project is planned to begin in 2004, pending approval by the U.S. Forestry Service. Proponents believe the new route would be safer than the current two lane road and increase tourism and commerce in the area; however, critics are concerned about environmental damage. I've updated the William H. Natcher Bridge page with pictures that I took on June 25 and February 16. The bridge and the Kentucky approach appear to be essentially complete. There was some work underway to install lighting along the bridge. The Indiana approach is still under construction. The Indiana Department of Transportation, Kentucky Transportation Cabinet, and HNTB Corporation held two public meetings this past Wednesday and Thursday to discuss the three favored routes for the I-69 connection between Indiana and Kentucky with local residents. The summary from the local news is that Henderson residents favor the two eastern routes while Evansville residents favor the western route. The Henderson Chamber of Commerce has indicated their support for the eastern routes. I attended the Henderson meeting and overheard some residents' fears that the study has understated the impact of I-69 on houses and farms in eastern Henderson County. Some Henderson residents have suggested building I-69 even further to the east than what is currently proposed. A Draft Environmental Impact Statement is expected to be completed by early 2003, with a final statement and approval by the Federal Highway Administration following in 2004. 2.8 miles of US 41 between the US 60 interchange and the Ohio River will be repaved through the month of July. 1.5 inches of the road's concrete surface will be removed and replaced with asphalt. Permanent traffic counting equipment will also be installed. A 1996 study showed 37,000 vehicles per day use US 41 just north of the Audubon State Park. Two public meetings will be held this week to discuss the the I-69 Ohio River crossing. One meeting is tonight at Reitz High School in Evansville and the other is tomorrow night at Henderson County High School in Henderson. City of Bowling Green Public Works Director Emmett Wood told the Bowling Green City Commission that the proper procedures were followed in the design of an extension of Dishman Lane. The extension collapsed in February leaving a hole that was 15 foot deep and 40 feet across. Wood said the planning began over 10 years ago and construction began in 1996. He said small changes were made to the plan and that changes to the drainage system caused by these changes may not have been accurately assessed. In hindsight, he says, these could be considered to be errors. More information: Daily News: Process not to blame in road collapse, expert says (June 19, 2002) . The group studying possible routes for I-69 between I-64 in Indiana and the Breathitt (Pennyrile) Parkway in Kentucky has narrowed the list of alternatives from ten to three routes. The alternatives, unveiled by Kentucky and Indiana highway agencies, the Evansville Urban Transportation Study, and HNTB, include two routes east of Evansville and one route west of Evansville. The other routes were eliminated because of potential damage to the environment, high costs, and low traffic volumes. 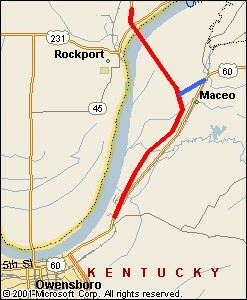 The currently preferred route, Corridor 2 (originally listed as H), would follow I-164 from I-64 to the Green River Road interchange before crossing into Kentucky. This route requires the least new construction, shortest Ohio River bridge, and would divert 55% of the traffic from the US 41 bridges. This route is estimated to cost $580 million. Another route, Corridor 3 (originally listed as I), would also follow part of I-164 but would cross the river east of Angel Mounds State Park and cost $685 million. The west side route would start at I-64 east of Poseyville, parallel the Vanderburgh county line, cross the Union Township oxbow, and cross into Kentucky. This would require at east eight miles of elevated roadway to cross the oxbow floodplain. This route, Corridor 1 (originally listed as J), would cost $959 million. The study will now move into the next phase: a draft environmental impact statement is expected early next year. In Kentucky, I-69 will use existing parkways. Upgrading these parkways to Interstate standards will take ten years or more. The Courier-Journal reports that a transportation cabinet bridge inspector, Kevin L. Earles, who pleaded guilty to soliciting bribes told contractors that he had "hammered" two previous contractors. The federal government is investigating to see if Earles had solicited other contractors for bribes. The Capital Avenue bridge in Frankfort will close for 16 days for repairs. "The bridge project, estimated at $750,000, will include resurfacing the bridge, and repairing the sidewalks, joints of the bridge, and the piers. Work will be done on one-half of the bridge at a time to allow emergency vehicles to cross if necessary." More information: KYTC Press Release , Detour Map (PDF format). and preliminary engineering of a railroad grade separation on KY 80 in Pike County . The Kentucky Transportation Cabinet's I-66 web sites have been updated. Information from planning projects in Ballard, Edmonson, Marshall, McCracken, and Warren county can be found here . The Official Interstate 66 website has been updated with information about the Ballard and McCracken segment and Pulaski and Laurel segment . A new vicinity map of the Pike/Mingo segment has been added. Also, the Phase 1 Archeological Survey for Pike/Mingo segment has begun. The Travel Information section of this website has been updated with information about Summer 2002 work zones. A transportation cabinet map of Summer 2002 work zones can be found here . The transportation cabinet has also posted driving tips (PDF format) and a work zone fact sheet . All of the links in the news items have been checked. Many of the links to older newspaper articles are now broken; however, I have managed to find some of the articles archived at archive.org and have linked to the archive where appropriate. In the past I have asked a couple of newspapers that regularly remove their articles if I could archive their stories online; however, both newspapers refused. I will continue to try to use as much information from those sources without infringing their copyrights. Also, the KYTC Division of Planning has recently redesigned their website (twice actually), and I have updated all of the links to that website. The Kentucky Transportation Cabinet has launched a new website to help relocate families affected by the US 460 reconstruction project in Pike County. According to the press release more than 200 families will be relocated due to the project. WPSD NewsChannel 6 reports in this June 19 article that the Kentucky Transportation Cabinet is inspecting bridges in Western Kentucky caused by the June 18 earthquake 9 miles northwest of Evansville. The quake measured 5.0 on the Richter scale and was the largest quake to hit the region in 30 years. The Brookport Bridge near Paducah was briefly closed. The approach to a bridge on KY 121 south of Mayfield caved in around 4:30am on June 6th. The problem was related to recent flooding. The flood waters washed away material underneath the roadway leading to its collapse. The hole was filled with sand and gravel and the bridge was reopened. A Knott County road worker who says he was fired after refusing to build a bridge on private property to provide access to a chicken coop has reached a settlement with the county. The dedication of the Natcher Bridge has been postponed due to scheduling conflicts with Indiana Gov. Frank O'Bannon and Kentucky Gov. Paul Patton. The bridge is now nearly complete. Three new America's Byways have been designated in Kentucky. These include US 23, "The Country Music Highway," in Eastern Kentucky; KY 15, "The Red River Gorge Scenic Byway;" and parts of US 25 and KY 229 which form "The Wilderness Road Heritage Highway." The National Scenic Byways Program was started in 1991 to preserve historic and scenic highways. It is administered by the Federal Highway Administration. These three routes are the first America's Byways to be designated in Kentucky. Bids to repair a collapsed section of Dishman Lane in Bowling Green came in lower than expected. Scotty's Contracting submitted the lowest bid for the project at $782,095. Repair of the 130 feet by 110 feet and 15 foot deep hole is expected to take 120 days. Work is planned to begin once Bowling Green Municipal Utilities relocates a nearby water main. A new website run by the Kentucky Family Safety Foundation allows users to, among other things, report road hazards to the appropriate government agency. Two bridge contractors who were solicited for bribes have attacked an audit of the Transportation Cabinet saying that is flawed by omissions and errors. A section of the Gene Snyder Freeway between I-71 and US 42 that had been closed for two weeks for bridge work and pavement rehabilitation was reopened on May 20th. The draft Six-Year Highway Plan currently under review of the state legislature includes funding for a $30 million interchange on I-65 in northern Warren County. The intention of the interchange is to provide access to the proposed Kentucky Trimodal Transpark . A similar interchange is proposed for I-65 in Hardin County. The Kentucky Transportation Cabinet has erected memorials dedicated to those who have lost their lives on Kentucky's roadways. There are nine such memorials located at Welcome Centers on interstates around the state. The Kentucky Transportation Cabinet has been presented two awards from the Intelligent Transportation Society of America (ITS America) for research and return on investment. The research award was awarded for the Louisville area TRIMARC system. The cabinet used a system of cameras and microphones to record accidents at an intersection. The data collected was used to make improvements to the interchange. The return on investment awarded for the ARTIMIS system in Northern Kentucky. The new William H. Natcher Bridge over the Ohio River at Owensboro will be dedicated at 10:00 am on August 2nd. It has been 62 years since Owensboro's only other Ohio River bridge, the Glover H. Cary Bridge, was dedicated on July 30, 1940. The Bowling Green city commission is expected to consider the costs of repairing Dishman Lane at the June 4th meeting. Bowling Green Municipal Utilities has already begun advertising for bids to relocate a 20-inch water main in the area. The relatively new road collapsed into a sinkhole in February. The city has been in touch with the engineering firms who first began planning for the road thirteen years ago to see what was known about the cave system in the area. The Kentuckiana Regional Planning and Development Agency (KIPDA) believes that federal money for transportation projects is at risk because of the state's elimination of Vehicle Emissions Testing in Jefferson County. KIPDA believes that Jefferson County will now be unable to meet EPA guidelines to receive federal transportation money. Critics, including state representative Perry Clark (D-Louisville), say that the report uses faulty data and Jefferson County will still meet the EPA guidelines. The Transportation Cabinet's Reform and Review Committee, which was created last year to identify problems in the cabinet, has submitted a report which finds that the cabinet failed to investigate claims of extortion, oversee the work of a bridge inspector, and monitor a minority hiring program. The committee has suggested the creation of an Inspector General's Office to continue to monitor the work of the transportation cabinet.